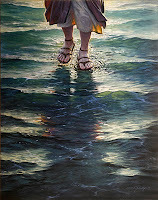 “Peter called to Him, “Lord, if it’s really you, tell me to come to you, walking on the water.” “Yes, come,” Jesus said. So Peter went over (climbed down) the side of the boat and walked on the water toward Jesus.” (Matthew 14:22-34, selected excerpts) For the past five devotions, God has take taken us on a mini-series through His Word regarding some founding truths of His Church. We again continue that divine quest for greater wisdom and deeper truth about His Church as we move into a subject area often left unaddressed when it comes to our Christian pilgrimage: RISK! You see, this life which God has so graciously given to all of us is to be an adventure, a journey, a spiritual trek filled with uncertainty, excitement and yes, risk! Erwin Raphael McManus, Pastor of Mosaic, shares in his book, Stand Against the Wind, “Living is no low- risk proposition. If life is an adventure, then danger (and risk are) inherent to the journey… (merely) existing provides a level of predictability and safety. Freedom (in Christ) is wild and wide-open, filled with unchartered territory.” We see this divine truth displayed in today’s text. Here it is – nearly 3am in the morning with the disciples in a boat in pitch darkness pierced only by the twinkling lights of the stars above when Jesus Himself shows up … walking ON the water! (He loves making such ‘cool’ divine entrances!) Like so many believers, we are fine to sail the seas of faith as long as we are in the ‘safety of boat’ …or so we think. Here is where much of His church is today … facing a life-altering decision to either ‘stay in the boat’ (i.e. the man-made box / comfort zone) or ‘get out of the boat’ and go (journey) to where Jesus is at (the place of divine miracles / encounters with Christ). Here in the early morning hours are the first disciples - God’s hand-chosen future pillars of the First Century Church - hunkered down firmly in their boat of “fear” (v 26) because they had now entered ‘unchartered waters’ … no level of predictability could have readied them for this divine encounter with Jesus. Like these disciples, each time our lives intersect with Christ Jesus in these ‘divinus momentos’ (divine moments), we too are faced with a response: either to be courageous (Joshua 10:25) and go where God is already at or we choose t o stay right where we are and miss the fullness of the divine encounter which God has planned for us. Only one disciple seized this divine moment – Peter. But note closely, Peter knew that to go where Jesus was (walking / standing ON the water) would be an impossible task on his own strength/abilities (Mark 10:27). So Peter asks Jesus, “Lord, if it is You, command me to come to You on the water.” (NKJV) This same confidence in the Lord is later seen in the Apostle Paul as he writes, “I have strength for all things in Christ Who empowers me [I am ready for anything and equal to anything through Him Who infuses inner strength into me].” (Philippians 4:13, Amplified Bible) When our faith rises to the level of accepting any/all risk that this journey of life entails, then Jesus will issue His call to us just as He did Peter, “Come! … come our of the boat to walk upon /over the waters of life!” So while the other disciples lay stricken in fear in the boat, Peter climbs OUT of the boat and walks on the water to Jesus! From his same book, Stand Against the Wind, Pastor Erwin Raphael McManus captures this divine ‘assumption of risk’ moment which we, like Peter, each will face when God calls us out of our boat, “If you choose to break free (i.e. leave the boat of familiarity & predictability), you will stand apart from the masses. At times you (may even) stand alone! (So be) willing to risk everything… Faith and risk are inseparable. It should not come as a surprise to us then that a life of faith is a life of courage….having faith is all about action. You cannot walk by faith and live in fear” (i.e. “You cannot stay where you are (in the boat/box) and go with God!” – Dr. Henry Blackaby, Experiencing God). So today, ask the Lord to allow His GPS (God Positioning System; “Holy Spirit”) to determine exactly where you are – in the boat with the masses or outside the boat where Jesus is and only few are willing to journey? Understand that God’s Church was never meant to be a place of comfort and risk-free safety … but instead we are to be a spiritual family of sojourners on a journey of faith who are willing to accept both the adventure and the risk that comes with being a genuine followers of The Way (John 14:6). When was the last time you heard Christ call YOU “to get out of the boat” and come to Him? Are you truly willing to risk it all to go to where He is at today? The Apostle Peter was … and over 2,000 years later we are still talking about his demonstration of courageous faith as seen in today’s text! …Selah! Today's Spirit-led video is by CCM artists Jeremy Camp and can be viewed by clicking on the on the song title, "Walk by Faith" - G3 for sharing His power-filled words thru CCM & Praise!